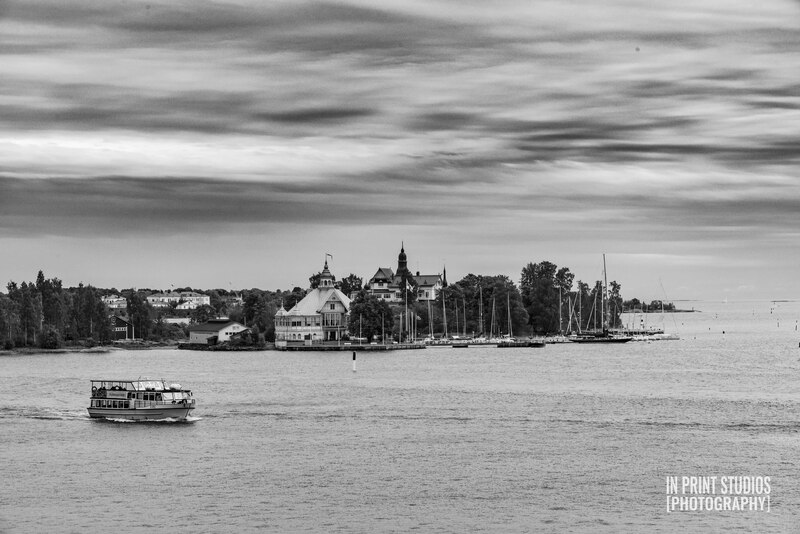 Under the overcast skies I feel completely at home in Helsinki. Everyone wears a light jacket of some sort. A dark blue raincoat. A black windbreaker. The occasional buttoned and belted coat, and the overprepared fur-lined anorak. After living in the Caribbean for a year and a half, I worry that I’ve been ruined by the tropical climes. But the cold air is a revelation, a reminder that I love the chill air (which is not the same as the cold). Within minutes of walking around, I take off my jacket and stuff it into a backpack. I revel in the cool weather, enjoying the crisp feeling of the air on my arms. We have 24 hours in Helsinki before our train to St. Petersburg. The streets are noticeably empty—maybe because it’s Sunday, maybe because Helsinki isn’t as crowded as Boston. I imagined thick crowds of tall blond people. To find empty streets is relieving. This is the first trip we’ve made to a country where neither of us speaks the language. It’s exciting, terrifying. It’s hard not to let the anxiety take over. “What if we get lost and don’t know how to ask where to go? What if we can’t order food? What if we starve?” I ask Natalie. “It’ll be fine,” she says. She’s confident about traveling to a foreign country. She served an 18-month mission in Hong Kong, starting off with only a basic level of Cantonese to get by. Completely immersed in a foreign setting, she thrived in that environment, awakening to her true self. I served a 24-month mission in California. While I had to learn Mandarin, I wasn’t in a foreign country. The default setting was always English. There were no foreign road signs or menus to decipher. “It’ll be ok. It’s an adventure,” she smiles. Adventure. That’s the promise of the trip. We’re going to Finland, Russia, and Hungary. We’re getting off the beaten path of the standard North American tourist of seeing England, France, Italy, and Germany. We’re going to the 2018 FIFA World Cup. ADVENTURE! Yes, but really, we’re also living the borrowed dreams of others. We were invited by some friends to go to the World Cup in Russia. Unfortunately, they had to drop out, but we kept to the dream and checked off a bucket-list item. The randomness of life never ceases to amaze me. I never thought I would ever go to the World Cup, let alone a far northern European country like Finland. Every street you walk down in Helsinki gives you a sense of their pragmatism. The buildings are simple and elegant, not flamboyant like in Western Europe. The streets are relatively easy to navigate. Everything is understated, simple, as though to express too much would be rude. I’m told this pragmatism carries over into their politics as well. The largest party is the agrarian party which is close to the center. The second largest, the Finns, is very conservative. Even its liberal parties are considered conservative when compared to places like the UK (then again, liberal parties in North America are considered quite tame when compared to the UK). They’re also an incredibly educated people. They firmly believe in the basic right to education. Sounds like any other developed nation, right? Their interpretation of this right is where things diverge. Post-secondary education is basically tuition-free. When you’ve passed an entrance exam to one university, you essentially have an unlimited pass to free education for the REST OF YOUR LIFE. Bachelor to doctorate. No material fees, no service fees, and definitely no tuition fees. I’m crying on the inside as I’m writing this, and my student loan debt just points and laughs. The locals we meet are quiet and smile politely. We’ve found our people! Natalie and I love them immediately. Though we’re in the downtown core of the city and we’re in the summer months there aren’t any homeless people on the street. I later learn that Finland has invested heavily in housing for the homeless, bringing their high of 18,000 people 30 years ago down to approximately 7,000 (with more than 5,000 temporarily lodging with friends and family). Moomin is always watching you. The country is famous for these bulbous fellas. I think they’re spies. But what surprises me are the number of Chinese locals. Tourists were to be expected—there’s really nowhere on earth that is safe from the emerging Chinese and Indian middle-class tourist—but what is different is the number of Chinese chatting with locals, restaurants that bear the evidence of being REAL Chinese food as opposed to “authentic” Chinese food. Evidence of long-term settlement. A pretty sales girl in a cramped souvenir shop switches quickly between Mandarin and Finnish, occasionally speaking English to a tourist with a question. I try not to let the astonishment show on my face and take extra interest in a reindeer bone carving. She speaks three of the most notoriously difficult languages in the world. I wonder at her story. How did this linguistically gifted Chinese girl end up working in a souvenir shop in Helsinki? Is she a student like so many others I’ve met in my years looking for a better opportunity than were available at home? Or is she a child of immigrants, Someone like me growing up in a world different from that of our parents? If there is one thing I’m eternally grateful for in traveling in “first world” countries, it is the simplicity of a purchase transaction. Thanks to credit cards, there’s not much need to struggle with currency or awkward conversations with the sales clerk. You bring your goodies to the cashier. She scans it and says something that you assume is the price. You hold out your credit card. She points to a credit card reader. You tap your card. The transaction is complete. She smiles and hands you your bag of goodies. You’re done! NFC technology magic. The simplicity of these tap-and-go interactions is the hallmark of a golden age for the consumer. Its never been easier to spend all your money. We have no Euros to our name, but we buy a traditional Finnish doll for my mother, illustrated postcards for me, a reindeer bone hunting knife for Natalie’s knife collection. The Chinese sales girl explains to me in Mandarin the complicated process to claim duty-free rebates on our purchases. I smile like I understand her, but eye the pamphlet she hands me for the English section. I’ll have to read it later. At first glance It looks like any other outdoor market that I’ve been to in North America. The tents are all uniformly shaped and aligned in straight rows. Local artists sell their handmade jewelry and paintings under their tents. Someone sells cheap black canvas bags with Helsinki printed in bright pink lettering all over its surface. A couple of young mothers push strollers slowly through the market, chatting idly while their kids squirm. Grandparents watch as toddlers stomp and splash the puddles. Yet as homogenous as markets are everywhere, there are details that reflect every local culture. Here a man sells reindeer skins. Pelts hang from the struts of the tent, and he sits behind tables piled high with beautiful white and brown skins. And of course, there is the food. Dustin pulls me to the row of food stalls and I immediately regret the salmon salad lunch I had minutes ago. We pass vendors selling piles of finger-sized fried fish called muikku (vendance in English) and thick slabs of salmon meat with salmon fat bubbling deliciously between flakes. The aroma is intoxicating. Natalie doesn’t agree and wanders away to look at a cute backpack with a Finnish flag waving moose. But more than the tourists, the market is the hangout of seagulls. Really aggressive seagulls. While I’m taking a photo of a fountain, Natalie watches a seagull swoop down on a teenage girl’s ice cream cone. As the girl screams in fright, the bird makes off with most of a scoop, its prize dripping from its beak. I stifle a laugh as she recounts the events. Karma has a way of repaying your amusement. 15 minutes later someone throws a fist-sized chunk of bread on the ground six feet in front of us. 22 seagulls fly close enough to our heads for us to feel the air from the beat of their wings. We’re startled, ducking furiously. I hope they don’t fly into my head, I think while bringing up my camera for a shot of the chaos. They caw at each other, fighting for scraps of bread. A brown-headed seagull flutters in late and inspects the ground for crumbs, but the flock has already moved on leaving no scraps behind. In the market a cheerful man sells me a silver-cast Viking bracelet. He assures me that it’s the perfect accessory for a man with a Viking name like Ivor. He has a friendly air about him and chats with us about where we’re from. There is a glint in his eye that says that though he is friendly, he could also be dangerous, protective of his own. “This is a warm summer?” Natalie says, stunned. It isn’t hard to imagine the hard winters, the cold permeating every layer of clothing as you walk through the streets. I thought Idaho was cold until I moved to Boston. Helsinki is even further North. Natalie glowers at the thought. At a lookout overlooking the bay an elderly couple from China approaches and asks me in Mandarin if I can help them take a picture. “I saw that you’re Chinese, and I knew that it was ok to ask you,” she says. Her face wrinkles with a kind smile. Her husband grins at me, bowing slightly. She calls me a young man, something that doesn’t happen very often these days. I feel a sense of kinship with them, our shared heritage overcoming any fears of talking to strangers. They too are on an adventure, but they don’t look like they are cruise ship passengers, or they belong to any particular tour group. Are they locals? Are they the grandparents of that Chinese girl in the shop? While it is a small world, the odds of them being related are very slim—especially when it comes to Chinese people. I wonder what kind of grandparents they are. Do they keep in touch with their kids? Are they on a 15th honeymoon? It’s been over a year since my own grandmother passed away. I often wonder about family, about whether I would hold the same amount of weight to family relationships if I had grown up with extended family nearby, or if I would have taken it for granted. The what if of childhood is an endless rabbit hole. After I return their camera, the grandma fusses over her husband, and he grimaces patiently, smiling at her. They wander off arm in arm. If there was a thesis to this stage of our lives after moving away from North America, it would be this: Enjoy the adventure and put some miles on your soul. At times I don’t feel like I’m in control of where I go in life. When I was 17 and preparing for college, I never imagined I would love Idaho. In Idaho I never thought I would move to the East Coast (West Coast forever), and in Boston I never thought we would move to the Caribbean. I’m grateful for the passage of time, the winding course of life. I hope that Natalie and I will age well like that elderly couple, that with liver-spotted hands, we will continue to find adventures to add to our story.